Photography is about so many things to so many of us. But probably more than anything, it’s about capturing the best photograph possible. An image that really stands out. And quite often, that means being at the right place at the right time. You can have all the skills in the world, all the best equipment that money can buy, but if you’re not in the right place and able to capture what Cartier Bresson coined “The Decisive Moment”, then you could easily miss some of your best photographic opportunities. Being a travel and stock photographer, I am sometimes in the most incredibly unique locations around the world but I always do my homework first. I study everything that I can, read about places I will be going to and try to figure out where is the best spot and what is the best time to be at these locations. When I see tour buses unload tons of people at 12 noon somewhere like the Eiffel Tower, I know that these people are not serious photographers. Pretty much shooting anything in the middle of the day is a guarantee of poor lighting conditions for most things. Early morning and late afternoon…. And well into the night is what I work with the most to capture the best mood and the best light for my images. To capture and create the perfect moment, much of it revolves around the time of day but also being at the right place at the right time. Once you have done your homework, you can’t always know but sometimes you might have a good idea that you will hopefully get just what you want. That was the case in the image above of the Big Dipper that I shot in Maine a few weeks ago. We were on a workshop, and knew that at this particular location where we actually went to shoot star trails, that we would get something pretty special. 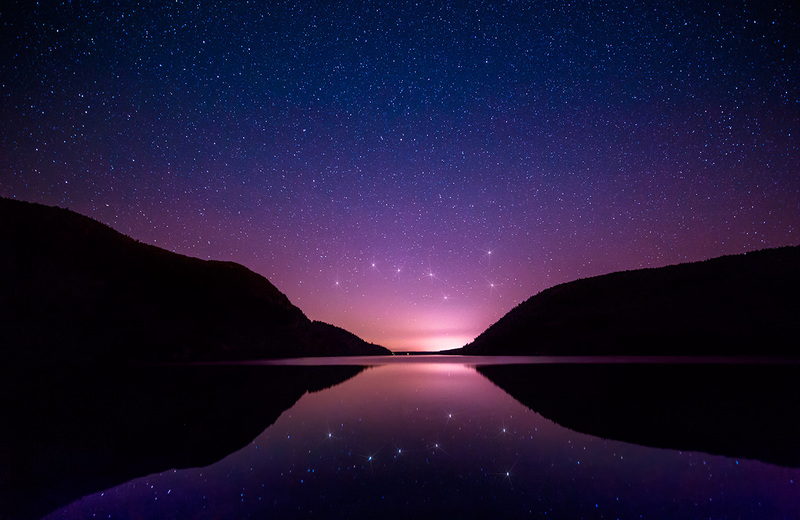 Although I got great star trails as did everyone else, it was one of my single shots of the Big Dipper just hovering over this amazing lake which became my favorite. I added some starbursts on each of the stars of the Big Dipper just to play around but this was one night that I will never forget. As all of us sat around, listening to our cable releases shooting shot after shot to combine later for star trails, we were pretty much speechless looking out at one of the most beautiful nights that I’ve ever known as a photographer. To me, this was absolutely the definition of The Perfect Moment. 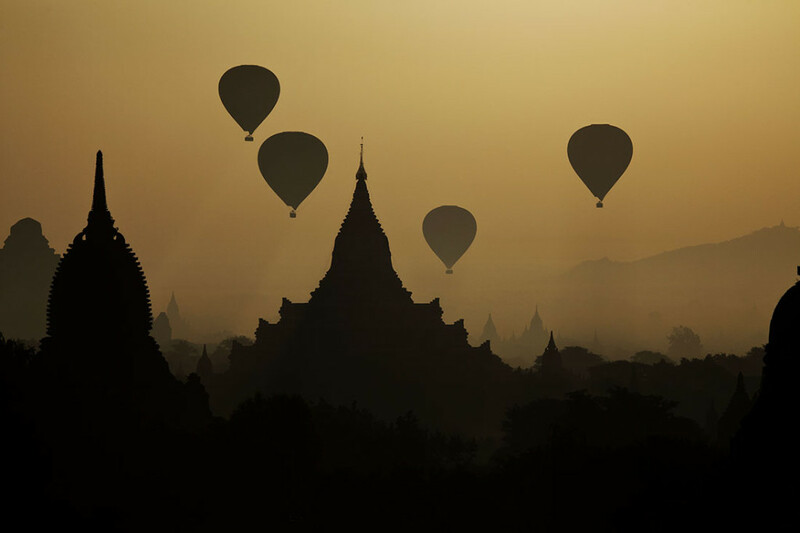 I know exactly where to be and when to be at the perfect spot to capture the hot air balloons floating across the most beautiful landscape in Bagan, Burma as I have been there many times either alone or doing my workshops there. Being a travel and stock photographer, I am sometimes in the most incredibly unique locations around the world but I always do my homework first, as I mentioned. I study everything that I can, read about places I will be going to and try to figure out where is the best spot and what is the best time to be at these locations. When I see tour buses unload tons of people at 12 noon somewhere like the Eiffel Tower, I know that these people are not serious photographers. Pretty much shooting anything in the middle of the day is a guarantee of poor lighting conditions for most things. Early morning and late afternoon…. And well into the night is what I work with the most to capture the best mood and the best light for my images. To capture and create the perfect moment, much of it revolves around the time of day but also being at the right place at the right time. 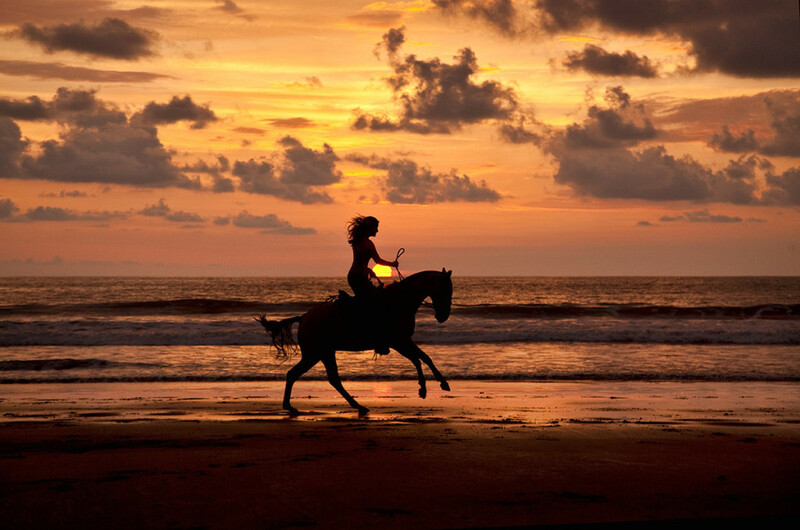 On the photo above, I planned to be on this amazing beach in Costa Rica at sunset to capture my fiancé, Holly, riding a horse in silhouette with the sun, waves and clouds directly behind her. I had a good feeling that this was going to be one of those perfect moments and it is the best feeling in the world when you get just what you’re hoping for. Many times you are lucky enough to be at the right place at the right time. For me, I sometimes have to create the perfect situation. I have to think about what I want and then go about setting up a particular shot. 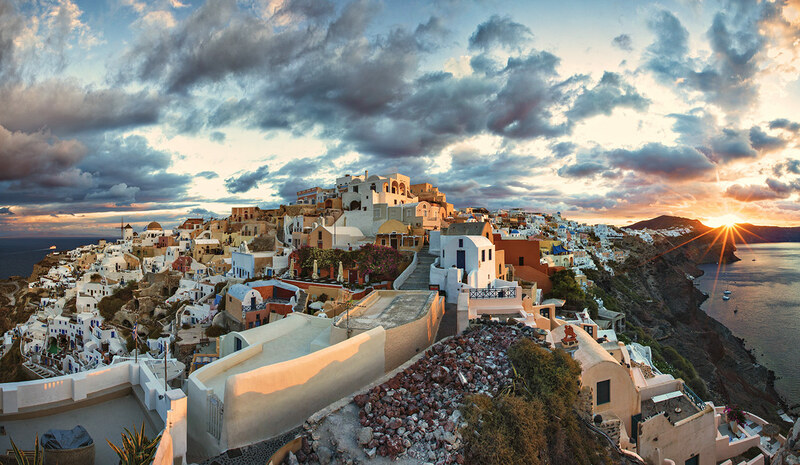 For the next shot in the town of Oia, in Santorini, Greece, I wanted to redo a really special panorama that I had captured years earlier at sunset from my favorite spots on the island. But this last trip a while ago, there were so many people that gathered every night for sunset that I knew they would ruin my shot. I wanted no one in the image so I decided to try something different this time. I decided to get up well before sunrise and get to my favorite spot and then see if I could capture something special with the sunrise and no one in the frame ruining my shot. Although it was freezing and incredibly windy, I got to my spot early, set up my tripod and panorama head and shot off multiple six vertical frame panoramas as the sun rose on the horizon and captured exactly what I was hoping for! If you plan things right and you throw in a little luck, you might get just what you’re looking for! Like I mentioned above, capturing something as iconic as the Eiffel Tower demands the right lighting conditions if you want something that is powerful. I have photographed the Eiffel Tower countless times as Paris is one of my absolute favorite spots on earth to photograph and I spend day after day, walking for 15 hours each day with Holly, looking for great photo opportunities. 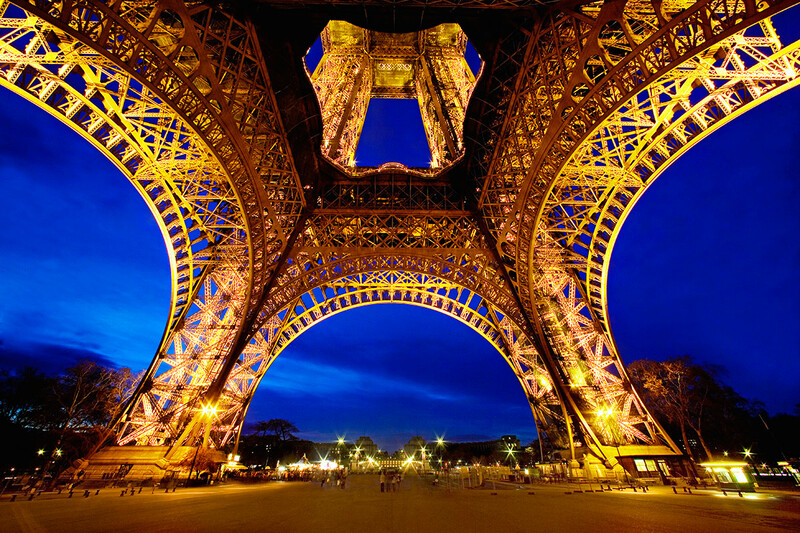 But I can never get enough of the Eiffel Tower and for me, probably my favorite time to photograph this special location is after the sun goes down. It is absolutely gorgeous with all of its lights on and I have so many shots from different angles and vantage points this way, but I love more than anything capturing it right after dark in the twilight with the cobalt blue sky in the background. On this particular shot, I knew exactly where I wanted to be and exactly at which time. On my tripod, set up with my 14 mm to get as wide shot as possible, I set my camera to ISO 125, f/13 and five seconds. With this long exposure, I was pretty much guaranteed the beautiful blue sky, which only lasts about 10 to 15 minutes. If you are in the right place at the right time, and you know what’s coming, you have a pretty good shot at capturing something pretty special. I captured exactly what I wanted and that should be your goal when you are traveling to incredible places for photography. Since then, the seemingly non stop construction and a ton of barricades at the Eiffel Tower has made capturing this same shot almost inpossible! 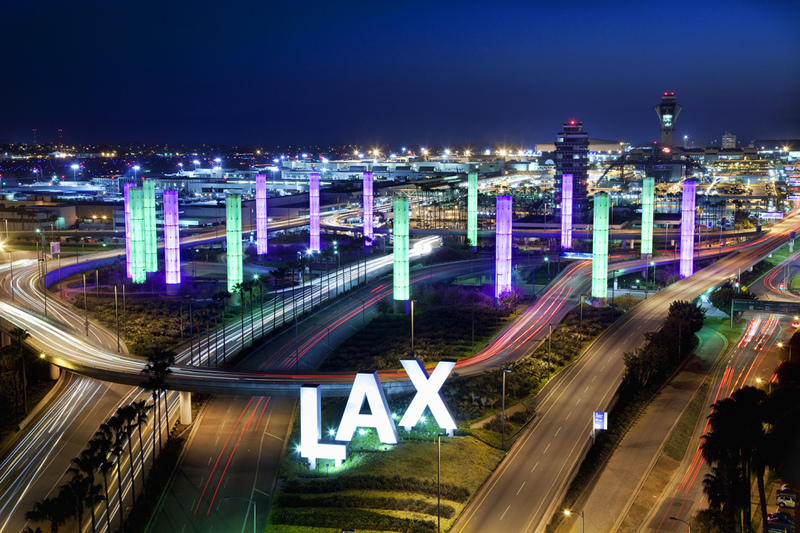 In the photo above of Los Angeles International Airport, this was another time where I knew exactly what I wanted to capture. Growing up in Los Angeles, many of the television stations had cameras on top of one building that had a perfect vantage point of the airport.They used this shot as the background shot during the weather segments almost every night. Almost no one knew where this was but it was always a spectacular background to see during the broadcasts. I finally figured out the location after pinpointing where it had to be while driving around the airport one day with my buddy. Then, I decided to find out who ran security for this building and was able to meet with them and let them know that I was a photography instructor from UCLA. Because of this, they gave me the green light for me and one of my students to go to the top of this building before sunset although we had to have a security guard with us the entire time. I again knew exactly what I wanted and that was to capture the beautiful night sky with a gorgeous blue from the magic hour along with the long exposure giving me car trails. Using my Canon 24-105mm, I knew that around 10 seconds at f/11 and ISO 100, would give me a gorgeous cobalt blue sky and some decent car trails, but I made sure that my image stabilizer was off. This is crucial as that would do nothing but completely blur the image with a long exposure like this. I helped my student set up her tripod and camera and she got exactly what I did and was as happy as I was.. When you pre-visualize the outcome but are also very comfortable with your camera gear, the sky’s the limit! When it all comes together, it becomes the perfect little moment to press that shutter! Speaking of sky’s, I photograph the night sky all around the world and I love teaching night sky workshops. In the image above, here in Sedona where we now both live, I always know when and where the Milky Way will be at its best as this is a true dark city and an amazing location for capturing the night sky. I took a group out on this particular night this last July, as this is probably one of the best times of the year to not only capture the Milky Way, but to capture it as a panorama. I showed everyone how to set up shooting vertical panoramas, either with or without my Really Right Stuff multi row panoramic gear. Knowing in advance that the Milky Way will come up somewhere between South and Southwest, I picked the perfect location to capture Courthouse Rock and Bell Rock in the image and the entire panorama of the Milky Way. I needed about seven shots while overlapping between 30 and 50% for each image and I showed everyone how to do this which is pretty exciting for the first time. Everyone got the shot and was able to stitch it all together later in Photoshop when I showed them how and this is a result of preplanning and being at the right place at the right time. I knew just where and when the Milky Way would be for a perfect panorama and I love sharing it with all of my students. Once you know how to figure out where and when the Milky Way will be at its best for photography, you then have more time to plan on getting the perfect shot at the perfect location! The photo above was a perfect example of being at the right place at the right time with a lot of luck thrown in! After shooting the Grand Canyon at sunset with one of my students and Holly last August, I decided that we should stay so that I could keep an eye on the night sky. Neither of them really wanted to stay as it was pitch black and you could not see a thing in any direction. But I had been shooting lightning in and around Sedona for the past month and a half and it was one of the best monsoon seasons for lightning in a long time. 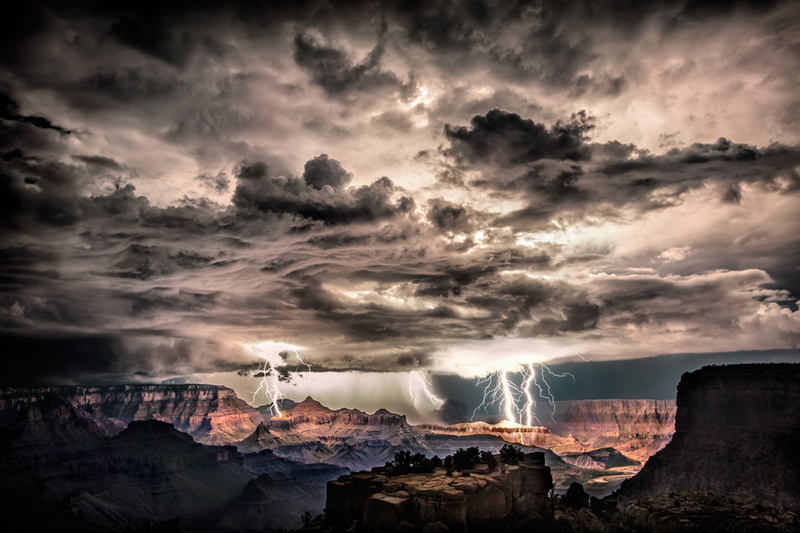 Sitting in the dark in the Grand Canyon, I was secretly hoping and praying that lightning would come and that my big wish would be granted: to capture lightning at the Grand Canyon. Out of nowhere, and after waiting a long time, my wish was granted and a huge bolt lit up the night sky. I screamed at both of them to get their cameras and I helped them set up their gear, including focusing which is always difficult after dark. We all got to shoot this amazing lightning storm for the next two hours which was as close to heaven as anything I have ever done!. It was one of the best nights of my life as photographer and one I will never forget as long as I live. In fact, in this month’s November 2014 issue of National Geographic, it is in the Visions of Earth section as a double-page spread and has been published more times than I can count all over the world. Getting this image was a result of patience, luck, knowing my gear and pre-visualizing the final outcome. 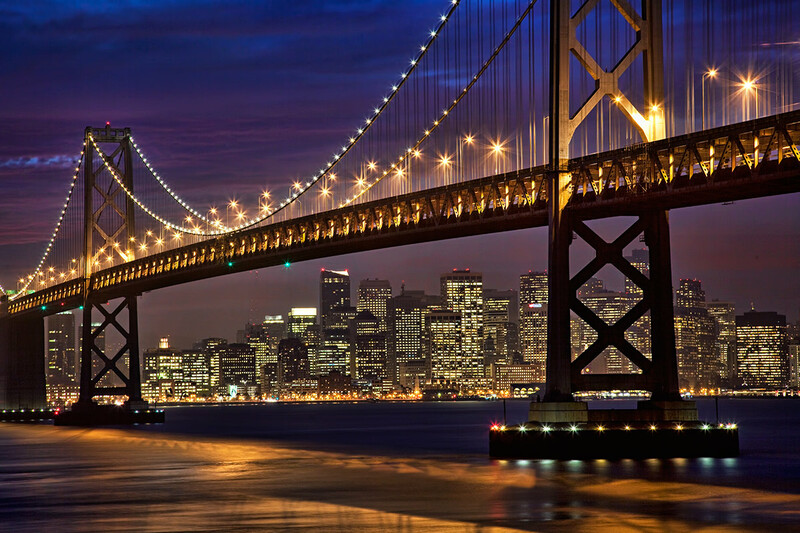 In the photo above, Holly and I had driven to San Francisco to capture images after dark. Many times, I will go to different cities just because of the amazing opportunities that they have for capturing gorgeous stuff after dark. San Francisco is one of those cities. I knew how I wanted to capture the Oakland Bay Bridge, but had no idea how to get to the perfect perspective. After scoping out with Holly during the day, we realized that she would have to let me off on Treasure Island, in the middle of the Oakland Bay Bridge, where there is a tiny little spot to pull over, and that she would immediately have to drive away and keep in contact with me by cell phone. Where I was was right by an Army base, with signs all over the mountain telling me this was restricted government property and to keep out. Well, knowing what shot I wanted, I had to climb down the mountain and hope that I did not get busted…. which was definitely a possibility. After a long and steep climb down, I found a perch that had a monstrous drop off and which was incredibly dangerous. Two feet in front of me was at least a 100 foot drop to the shoreline below. But I knew from this angle, high above the ocean, that I would get exactly what I wanted. This was the vantage point that I had dreamed about and gone over in my head countless times. The only way to capture it was exactly the way I had preplanned it and I called Holly on the cell phone and told her that I was going to get the shot, and I did! Once again, using my trusty Canon 24-105mm that I never go anywhere without, I set my camera this time to 15 seconds at f/14 with an ISO of 125. I knew this would get me exactly what I wanted and with the San Francisco skyline glowing in the background, I knew that the tiny f/stop would make all of the lights on the bridge turn into little starbursts. The advantage to long exposures at night is that you can use small f/stops like f/11 to f/22, and get some great little starbursts on any bright light sources. Although this shot was a tremendous amount of work, I got exactly what I was hoping for as I love shooting after dark more than anything! In the darkness, on a small ledge on a cliff, I was able to capture the perfect moment! I knew where to be and when to be there as I knew that a long exposure might capture some great car trails from this famous street…. 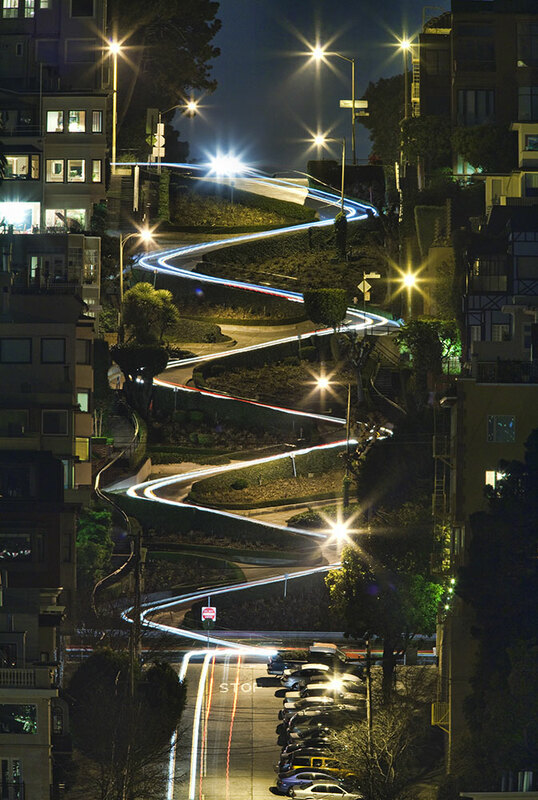 And although the speed limit around these incredible curves is only five miles per hour, I was hoping that I would capture something great in a 30 second exposure. Using my 500 mm and extender to get that 700mm perspective, I got exactly what I was hoping for and this was another situation where planning on being at the right place and at the right time can give you just what you want! One car went from the top to the bottom in 30 seconds and then kept on going down even further and I knew I had captured something special! Although people have copied my idea for this and other shots, it’s a great feeling when you know that you were the one to come up with it first. I love shooting after dark and there are so many amazing cities all over the world that can give you amazing one-of-a-kind images for that perfect moment! In the last photo above, I was doing a workshop with a friend earlier this year in the south of France. 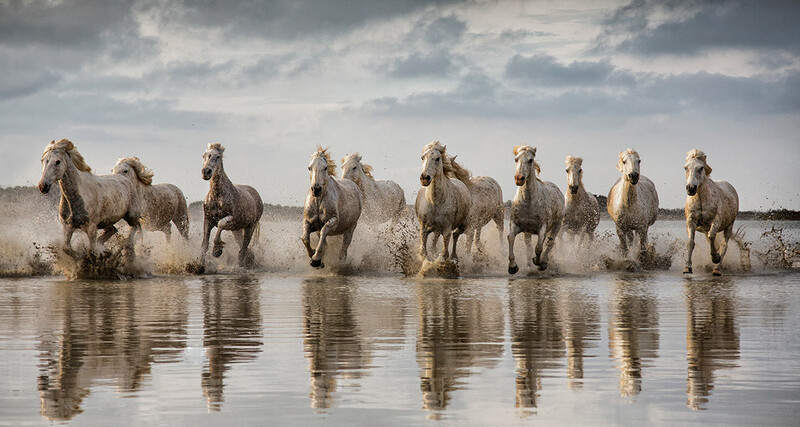 We hired the owners of many ranches to bring out their beautiful white Camargue horses and give us some unique ways to capture them. This was my second time doing this with my friend and I knew I wanted to capture an even bigger variety of things this time. For this particular image, I had everybody line up on the side of the water and told the owners to have all 11 horses run almost directly at us. Although seemingly a little bit dangerous, I knew this would get us an incredible perspective and I knew exactly what I wanted for everyone to capture. I made sure that the cowboys stayed far enough away so they would not be in the frame but that they were close enough to make sure all of the horses stayed together. I screamed at everyone to make sure they had the right settings on their camera and to get down low for an even better perspective. I knew beforehand just what I wanted and I made sure they had the horses run many times right towards us so that everyone got fantastic shots. To me, this was the perfect shot as it was everything that I was hoping for from that day. Planning, preparation, skill, knowing your gear and of course a little bit of luck is what you need to get that “Decisive Moment”. When you put it all together…. and when things are going your way, you will come away with something incredibly special! To me, my four favorite words as a photographer is “ I got the shot!!”. It’s the best feeling in the world and if you are prepared and can pre-visualize just what you want, you will be screaming out those words too! Nice thoughts Scott and great images, as always! Even I know many of them, I always like to see them again! And I love the way how you highlighted Big Dipper!!! COOOOL 😉 Ahoj! P.
and glad you liked the blog post. I never work on my blog..way too busy….. but I thought about perfect moments and they happen once in a while and are so special!! we had some prefect moments in Death Valley with you!!!!! I’m a Photographer student in Mexico. If I have someone to admire is you. I love your work. I have been followed you for a long time. Can I have an advice or at least tell me how you take your nigth pictures. I have some problems with the bulb. I’m not sure if I wrote back to you…. as I do not check my blog too often…. but please email me on my website to my regular email… and I will respond there… okay Andres? I do not think this message until now… the best way to be in contact with me is my regular email… and that is on my website….